This Was The Week That What? How can we raise the level of civil discourse when we can’t even be civil? Or civilized? I was going to fill in the blanks of my long absence here by explaining that I had spent so much time watching, listening to and reading about last year’s presidential campaign that I ended up not writing about it. There was so much commentary and drama ad infinitum that I didn’t think another voice was needed in the conversation. However, after all the campaigns were over and I had fully digested the political spectacles on both sides, there was one word left that pretty much summed up those long months for me and what I thought of the level of public discourse: disgusting. On the Republican side there was the egregious name calling, lying and fear mongering of the lowest levels, and on the Democratic side there was also mudslinging and a well oiled pr campaign that was almost too slick, too seamless, and too flawless. No one’s that perfect. Creating that kind of celebrity status for a presidential candidate left me feeling very uncomfortable, and I’m not sure that I can explain why. We already have too much emphasis on the cult of personality over substance, and I so wanted substance. It was no wonder that then candidate Obama’s personal and political eloquence was such a breath of fresh air, rescuing us at moments from the hype und drang. Granted, one can argue that that’s what makes presidential politics so much fun, and I must admit, it’s the only sport that I follow with glee. But there was something in all of the primaries and the subsequent presidential campaigns that just left a bad taste in my mouth. It got downright uglier than usual, in my estimation. Having watched for years from the inside of the news when I worked at TIME, where I lived through two presidential campaigns, I perhaps have a different perspective than most casual viewers. Those of us on staff who were curious enough (that would be me) would question writers just off the campaign buses and planes to dish out the gossip on both sides of the political circus. Always yummy fodder. But it wouldn’t get reported or spoken about much outside of those hallowed and, for the most part, discreet halls. I personally wouldn’t dream of repeating hearsay to anyone outside of the office. How unseemly. But something has changed in our 24/7- live-out loud-in-public-on-the-Internet-with-no-boundaries-or-shame society. It seems to this observer that we now live in a time when apparently nothing is sacred. Now things that might have been told to me in whispers seem to be shouted out loud to the media by the guilty parties themselves. I just don’t know what to make of this. Honestly, I’m in culture shock at my own culture. –right wingers carrying signs of the president of the United States as Hitler in a Nazi uniform and pugnaciously shouting down their elected officials in public forums. –Congressman Joe Wilson: I can heckle the President of the United States during a serious address to the nation, while the world watches, and I will only apologize when forced to and now you should give me money…. People, please, don’t apologize in public or share your private moments. Here’s what I want: Be ashamed. Be very ashamed. What happens when uncivil and uncivilized behavior goes unchecked? What kind of society do we want to have? The word “civil” is derived from the Latin word “civilis”, which means “citizen”. I’m for that. Let’s put civility back in the citizen. Civility seems not only to have left the building but also the continent. Can we raise the level of public discourse in this frothing fray? I voted for intelligence and rationality. At least in public, we can show a little class. Media training, anyone….? 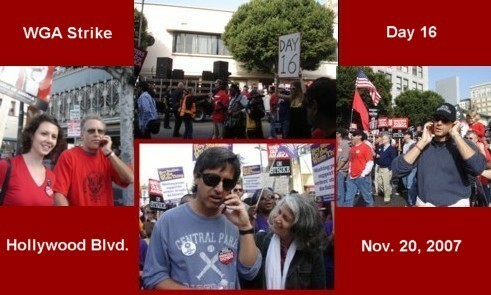 Who are these people, why are they on cell phones in the middle of the WGA strike rally in Hollywood, and why is JS smiling at Ray Romano? Tuesday, Nov. 20, was day 16 of the WGA strike and thousands of WGA writers, producer/showrunners, and SAG actors showed up to march down Hollywood Blvd. in support of the ongoing walkout. 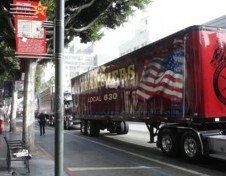 Also there to lend some muscle was the Teamsters Union, who parked three enormous rigs on Hollywood Blvd. It seems that lots of folk are jumping on the bandwagon (there was an actual band wagon, where Alicia Keys performed two songs) to support the striking writers. I even saw a small contingency of nurses, who arrived with their union signs and joined the march. Lending culinary support were members of CAA who walked around with mountainous trays of scrumptious scones and provided hot cider. Besides Mr. Cuse, also joining the teleconference were Ray Romano (pictured above with yours truly) and, on the right, Jonathan Lisco, showrunner/executive producer of the new TV show “K-Ville“. In addition, speaking to the cell conference was a showrunner from the Disney Channel and the very gracious and lovely Debra Messing. Talk about a moveable feast! Or was that a moveable feat? While marching with thousands of people shouting strike slogans, and the ever present choppers above, we could barely hear each other speak, yet somehow these notables managed to keep pace with the crowds and talk on the cell phone to the writers around the country. My hats off to them for a) being troupers and showing up for the strike with no fanfare or self-agrandizing and b) lending their impromptu support to strangers on a phone thousands of miles away. The rally ended two hours later at Grauman’s Chinese Theater with some rousing speeches by the WGA and Teamsters reps and a heartfelt talk by Sandra Oh. All left feeling well supported and pumped, and hoping for a happy Hollywood ending. Soon. More accurately, last Thursday night’s panelists vigorously discussed and debated the question of celebrity “news” and the “stalkarazzi”, but I do love alliteration. Officially titled “HOLLYWOOD GROUND ZERO: Where Celebrity, Paparazzi and the First Amendment Collide”, the event was sponsored by the LA Press Club and PR Newswire and took place at the Steve Allen Theater in Hollywood. Moderated by BBC World News correspondent David Willis, the panel consisted of Blair Berk, a Los Angeles criminal defense attorney whose client list includes numerous A-list celebrities; Giles Harrison, top-earning paparazzo of London Entertainment/Splash News; Rob Nelson of KABC-AM790 and E! Entertainment THS Investigates; and Allison Hope Weiner, a Los Angeles based reporter for The New York Times (who is currently covering the Anthony Pellicano story). The evening began with a ten minute viewing of the E! channel’s hour long program THS Investigates: Paparazzi. Hosted by panelist Rob Nelson, the investigative story covered the current state of celebrities and the paparazzi in Los Angeles and the legal issues involved. Two of the panelists had appeared in the story: Berk was interviewed in her office, and Harrison took Nelson with him one day as he drove around in his vehicle, on the job as a paparazzo. In one scene of Nelson’s story, we see Katie Holmes with baby Suri emerge from a building and arrive at the sidewalk. As the paps lunge for her, they practically knock down the woman next to her–Tom Cruise’s mother. Another issue is that car chases become commonplace on the highways when the paparazzi spot a celebrity in their car, knowing not only the type of car they drive but also the license plate number. In another scenario, Jude Law leaves his house with his children. When he spots the cameras on them, he crosses the street to where the paparazzi are standing, blocks the TV camera lens with his body and in a very angry tone of voice threatens to turn in the photographers for being pedophiles if they don’t take their cameras off his kids. End of scene. After introductions by the panelists, Willis got the discussion going by asking the important questions: Do the paparazzi go too far? Should the press and/or the paparazzi be regulated? Who are these people? He called on the expertise of each panelist and asked for their take on the situation. Panelist’s positions were clearly defined: Weiner was opposed to any press regulation, defending a free press and fearful that trying to regulate the tabloids could lead to putting a stranglehold on all press. Berk defended the rights of celebrities as individuals who deserved a degree of privacy and spelled out the personal and public safety issues of paparazzi gone wild. Harrison tried to create a more balanced view of the paparazzi, reminding the panel and audience that they are not all aggressive stalkers, including himself. Harrison, who prides himself on his forthright behavior as a paparazzo, was introduced as someone who had once spent time in jail for an incident early in his career. Why all the paparazzi madness? With the proliferation of supermarket tabloids and the pressure for lurid stories and photos, there is more money than ever for the photo agencies and the swarms of paparazzi have increasing competition for the high-paying scoop shots. “Reality” TV shows also feed into our voyeuristic culture, often including celebrities who expose far too many details of their private lives. 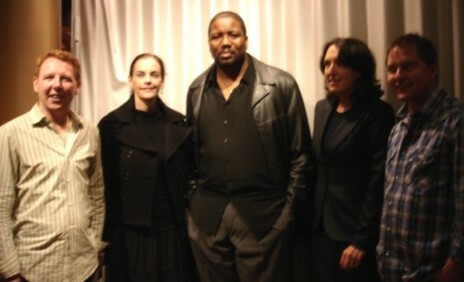 At the same time, there is the growing mainstreaming of an industry of “celebrity news”, for example AOL owned TMZ.com. But is it really “news”–stories about actual events? Or just old-fashioned gossip–innuendo, hearsay and outright lies? After the much publicized car crashes of Lindsay Lohan and Scarlett Johansson (see “Scarlett Johansson Crashes Car While Fleeing Paparazzi”), both of which were caused by being chased by paparazzi, as well as the actions of an aggressive photographer at the Disney theme park with Reese Witherspoon and her children, Democratic Assemblywoman Cindy Montanez introduced a California state bill aimed at the paparazzi. The bill, which became law on January 1, 2007, triples the damages celebrities can claim from paparazzi if they are assaulted while being photographed. Further, the bill prohibits photographers from making money on any photographs taken during an altercation. But, commenting on this new law Thursday night, lawyer Berk deemed it virtually “useless”, as it calls on celebrities to press charges and file lawsuits, which most are reluctant to do since that only draws more attention to the situation and then creates …another tabloid story! Nonetheless, Gov. Swarzzenager was more than happy to sign the bill. As reported on MTV.com “When Schwarzenegger was an actor, he testified against two photographers who used their cars to surround his as he was picking up one of his kids from school in a 1998 incident. At one point, Schwarzenegger had suggested creating a buffer zone between paparazzi and celebrities.” In fact, it turns out that panelist Harrison was one of those photographers. The problem, of course, is that the celebrities don’t mind a little of this; they want to be noticed in a positive light at least and seen in the tabloids for the free publicity. But the relentless chase for photos has gotten to the point of being non-stop, excessively invasive, overly aggressive and overtly dangerous. As Berk says on camera in Nelson’s THS story “It’s not a matter of if, but when” someone is going to get killed. Commenting on her onscreen prediction, she said at the panel that she believes it won’t be another celebrity, like Princess Diana; it will be the innocent bystander on the street or someone in a car who is driving nearby on the highway. For an example of this paparazzi pandemonium in the streets, see the video here posted by TMZ.com on February 21, 2007. Britney Spears is mobbed by paparazzi as she steps into a car, which is being driven by a friend [?]. (Be sure to listen for the number of camera shutters you can hear clicking away). A police car comes to their rescue (did they dial 911? ), disperses the paparazzi on foot in the street who are blocking the car and other traffic, and, over a foghorn, instructs Britney and friend to make an illegal and potentially dangerous right hand turn from the left lane and around the other cars stopped at a red light in front of them.